As a pioneer in the automatic textile industry over the past two decades, Wuxi Hengjiu Electrical Technology Co., Ltd. has upheld its motto of "Manifest Innovation through Perseverance, Achieve Far with Time". It serves as one of the organizations to develop standards for automatic cotton spinning leveling devices. It is one of the best provides of fancy yarn devices. Thanks to the innovative experience accumulated over more than twenty years, the Company has a number of patents and software copyrights. Its "Hengjiu High-Tech" brand has fully shown its visibility. It has established cooperation and achieved a win-win relationship with several wellknown manufactures at home and abroad. So far it has won trust from more than 2000 company customers by exporting its products to Southeast Asia. In 1992, Hengjiu Electrical successfully applied variable frequency technology in technological reform of blowing machinery, and took the lead in the production of the first auto-leveler blowing instrument with variable frequency in China. In 1995, it was the first to create a CCA auto-leveler regulating instrument, reducing the unevenness issue that seriously disturbed textile enterprises with its high-end technology. In 1997, CCB cotton auto-leveler regulating instrument replaced importations by making significant contributions in such respects as the massive supporting and reforms of Qingdao Textile Machinery Co., Ltd., Saurer (Jintan) Textile Machinery Co., Ltd. and Dongjia Group, promoting the automation applied in textile industry and raising the automation level of Chinese textile industry. In 2000, model CCZ servo driven slub yarn devices were widely applied. Afterwards, the Company has continued with upgrading and innovation, launched in succession model CCZ-VII multi-functional fancy yarn devices, CCZ-8 intelligent high precision slub yarn devices, CCZ-9A intelligent corrugated yarn device(premium slub yarn device), CCZ-7S multi-functional fancy yarn Devices, CCZ-Ⅹmulti-functional fancy yarn development machine and CCZ-XI modularized fully E-drive devices. It has become an enterprise widely known within the industry. It dedicates itself to creating values for customers, and leading the whole industry on an innovative path. According to third-party statistics, by the end of year 2017, CCZ series fancy yarn devices of "Hengjiu High-Tech" ranked the first in Chinese relevant market shares. 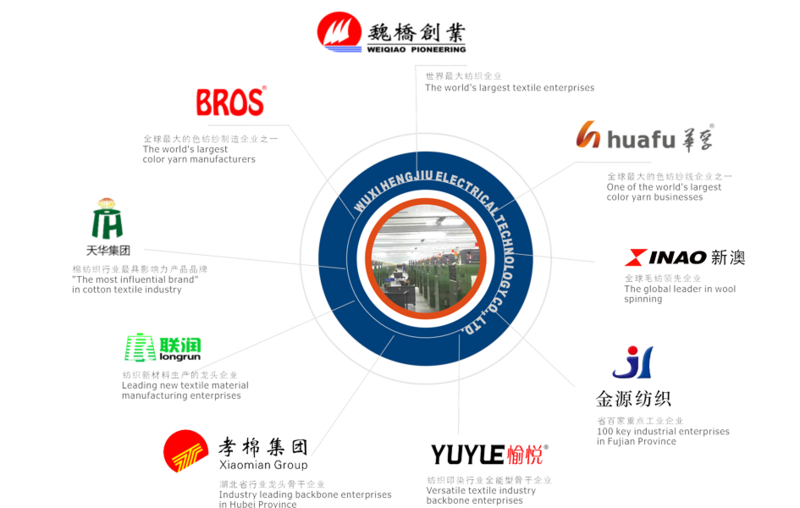 The comprehensive strength of Wuxi Hengjiu Electrical has been widely recognized in the industry, steadily occupying the first place among the textile peers.